Are you a retailer? 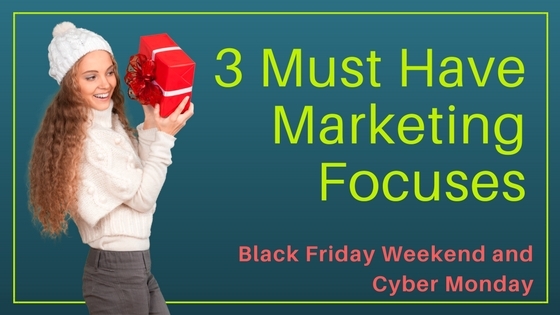 Being able to capitalize on the “hype” of Black Friday (weekend) and Cyber Monday can be of huge importance to your business. During this coming Black Friday weekend, as reported by Winswig in Forbes (2017), it is forecasted that sales will represent a 47% growth over last year. According to RetailMeNot survey, consumers will spend an average of $743 this year during this weekend. National Retail Federation’s research indicates that number is even higher at $967.13. Research shows that 4 in 10 retailers are planning on pushing offers for an entire week. What is incredibly interesting is how the mindset of the consumer has evolved over recent years and how the consumer has been pushed to engage in purchasing during this time period. This means consumers have been “primed” to spend, spend, and spend. Now how do you get the “ready, able, and excited consumer” to spend with you? Focus on every touch-point. Examine carefully every touch-point your brand has with its consumer. Leverage and capitalize on these touch-points. Recognize that consumers will most likely shop you online before considering coming into the store. Consumers will be browsing online, comparison shopping, and making decisions many days and even weeks before the Black Friday weekend/week hits. Aim to build a cohesive brand experience across all touch-points. Use social media channels to create excitement and a reason to engage with the brand. Focus on your digital footprint. With E-commerce surpassing retail location sales and with the influence the digital footprint has on retail locations, this means businesses need to focus on how to provide easy-to-use websites and focus of SEO strategies to have your business “show-up” properly in relevant searches. The consumers are ready to spend. You need to make it easy and engaging to spend with you. Even if your business is not centered around e-commerce sales, your ability to capture the consumer through your digital footprint to have them come to your retail location is paramount to success. Develop hyperlocal consumer experience. Focus on hyperlocal strategies across your digital footprint. Make your website particularly local and personalized. Research is showing that consumers prefer experiences that make them feel the personality of the local store over the “big box” approach to marketing. Develop your email list. Make your emails personal and unique to the customer, with clear, engaging subject lines and content that adds value to the consumer. Send out real-time promotions. Utilizing your store’s website, Facebook, and/or email, offer digital handouts online. Research by PayPal shows more than 50% of the consumers prefer real-time promotions and respond to such promotions. Follow the 4-1-1 social media rule. Across your social media channels, especially Facebook, when developing your content marketing strategy, follow the 4-1-1 approach. Four posts need to be posts that are truly engaging to the consumer, adding value to them such as educational ideas or giving them a chance to do something, such as post their favorite holiday….something. Then one post can be a soft-promotion (click here to learn more or sign-up to be on the store’s email list) and one post is a hard-promotion (a specific call-to-action) sale’s push. Do not fall into the trap that every post has to have a coupon or sale’s gimmick. Build brand awareness with handouts. Present handouts to all customers shopping instore and drive consumers with special promotions to get them to go to your website or Facebook page and then actively engage them in your content. Track your customer purchases and abandoned shopping carts. What they may have left in “online shopping carts” by not completing the transaction has value. Develop strategies to send reminders, special promotions, etc. to those customers. Develop brand loyalty and return shopping. Focus on the in-store shopping experience. Consumers categorically do not like the holiday shopping pushy, hectic, aggressive holiday shopping experience. You need to make it easy for the consumer to do business with you. Focus on how to make the in-store shopping experience personal, caring, and appreciated….and remember, that consumer will have probably shopped your offerings on-line first. Therefore, first impressions may very well be your e-commerce platform. Loyalty and punch cards programs to keep customers coming back. The power of a gift card is amazing. Research by First Data, shows that gift card purchases this year will reach $140 billion and when people redeem the cards, 72% will spend more than the value of the card. Set up your website to offer gift cards, promote gift card sales in your store at the point-of-sale location, send out special gift card discounts to loyal members—develop your customer base and increase revenues with gift cards. You can even sell your gift cards on eBay, Etsy, or Craigslist. Research from National Retail Federation indicates that 61% of all consumers would prefer receiving a gift card for the holidays and 70% of women would. Effective marketing strategies will cut through the noise of the season and brand you as unique and centered around the genuine needs of the consumer. ~Sabrina Pack-Professional Certified Marketer with SkyWest Media. 2017 Holiday Retail Trends and Guides. (2017). RetailMeNot. National Retail Federation Holiday Headquarters. (2017, Oct.) NRF. Smith, A. (2017, Oct. 27). NRF Consumer Survey Points to Busy Holiday Season, Backs up Economic Forecast and Import Numbers. NRF. Weinswig, D. (2017, Oct. 27). Black Friday and Cyber Monday Predictions. Forbes.